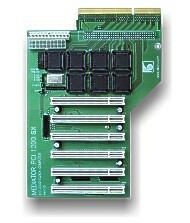 The Mediator PCI 1200SX is a busboard designed to give towered A1200s active PCI slots. It contains both AT and ATX power connectors, allowing the busboard as well as the Amiga to be powered from a standard PC power supply. It has been reported that the Mediator does not work with the Viper 1240 or Viper 1260 but is known to work with the Blizzard PPC/060, Blizzard PPC/040, Blizzard 1260, Apollo 1260, Blizzard 1240, Apollo 1240, Blizzard 1230 (III, IV), Apollo 1230, GVP 1230, Elbox 1230 and M-Tec 1230. The Mediator 1200SX is designed to be used with one of the following tower systems. Incompability with GVP 1230 "It looks that there are some GVP A1230 cards of a special series, which does not allow to configure any other cards in the Zorro space. There are some reports that there was a batch of GVP cards, which have such "feature". If this is a card from this batch it will also not work with any Zorro II or Zorro IV busboard. Elbox has not had any GVP A1230 card in their office. Maybe they are equipped with a jumper (soldered or not on the board), which determines if this turbo card allows or not to configure any other boards during the Amiga autoconfig cycles."